Armoury introduces a collection of original thrones that belonged to Russian Tsars and Emperors. 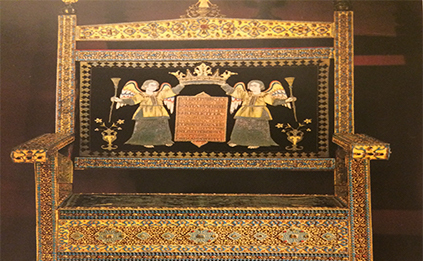 The oldest throne in the collection dates back to the early 17th century and is a work of Persian craftsmen. The other throne in the collection is the ivory-plated throne – a work of craftsmen from Europe. At the picture you can see the so-called Diamond throne – one of the richest and most finely decorated thrones in the collection. It was presented to the Tsar Alexei Romanov by Armenian trading company. The Diamond Throne is made out of sandalwood faced with gold and silver plates and decorated with 2 huge smoke topazes in the center and 876 diamonds. 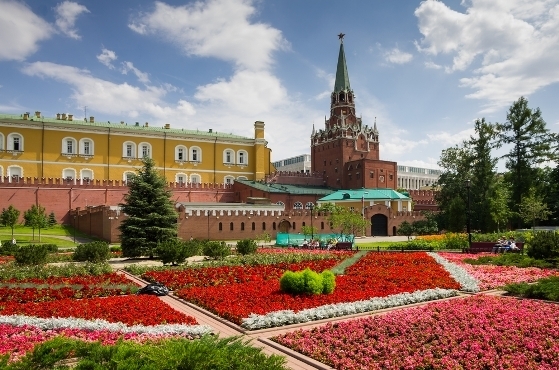 Discover, how much did Tsar Alexei paid back for this throne? 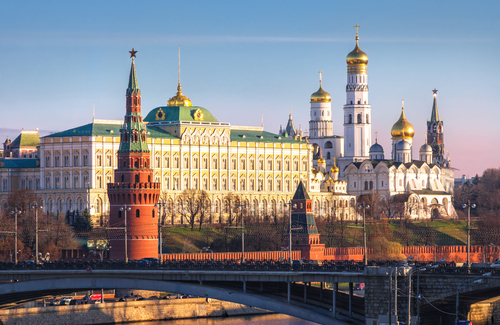 This collection allows visitors to understand the history of Russia and see how the country developed throughout the centuries. 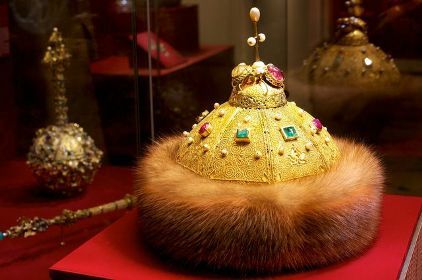 The oldest crown of the collection (as you can see in the picture to the left) is a legendary Golden Cap of Monomachos – which was used to crown all Russian Tsars up to Peter the Great. 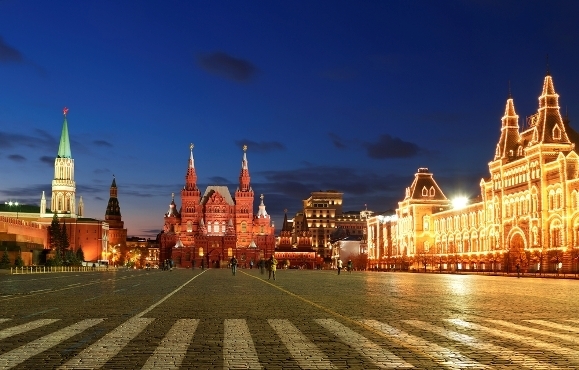 It is one of the symbols of the Russian middle age statehood. The Cap of Monomachos is of oriental workmanship of the late 13th and early 14th centuries. It consists of eight gold plates put together with very fine gold lace. Peter the Great introduced Crowns made in European style and since that time Russian Emperors were crowned according to European traditions. Find out, who was first crowned with a new European-style crown? This collection includes original coronation dresses from the early 18th to the late 19th centuries. 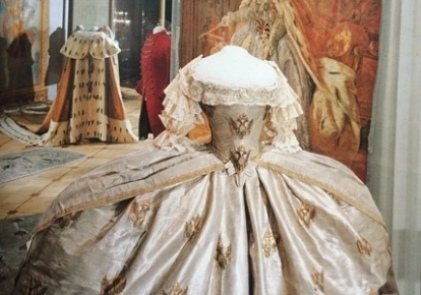 During his study in Europe, Peter the Great saw collections of coronation dresses and issued a similar one in Russia after he had returned back. Russian sarafans and long gowns were replaced by short kaftans, camisoles and dresses with low necklines and short sleeves. Women found it particularly hard to get used to a new fashion and were strongly opposed to Peter’s reforms, but they soon realized the advantages and gave them active support. All coronation dresses were made out of rich fabrics and decorated with pearls and golden and silver thread embroideries. Discover, how many dresses were in the collection of Empress Elisabeth? The collection of Church vestments introduces original items from the early 14th to the late 19th centuries. 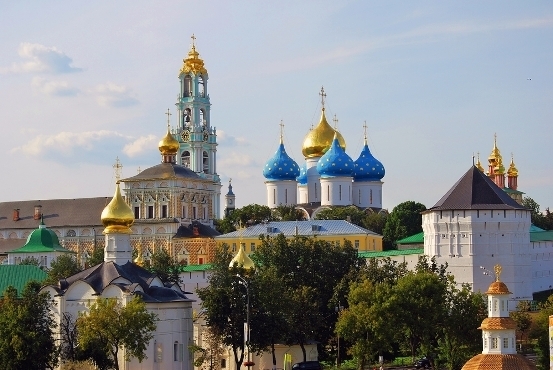 Most vestments belonged to the heads of the Russian Orthodox Church – Metropolitans and Patriarchs. 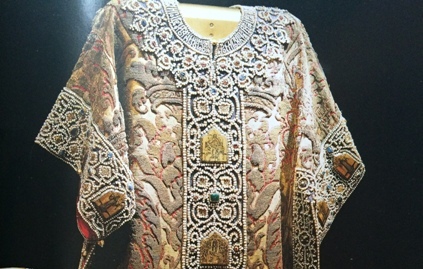 All vestments in the collection were made out of rich fabrics and had been richly decorated with pearls, gems and golden and silver thread embroidery. The gowns depict images of Jesus, Virgin Mary and revered Saints, texts of prayers as well as icon images made in niello technique on golden plates. Our guide will tell you peculiar facts about people to whom particular vestments belonged to. Discover, what is the weight of the vestment of the Patriarch Nikon? 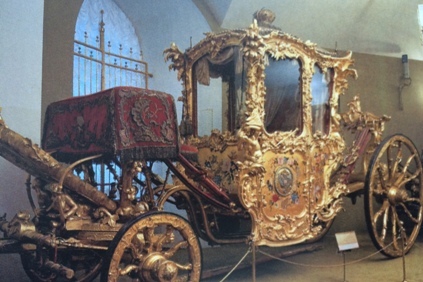 In the next hall you will observe a collection of original Royal carriages from early 17th to late 18th centuries. The collection is a visual illustration of carriage art development: from first flivvers without turning wheels, doors and windows to highly technically developed carriages of the late 18th centuries with turning wheels, glass window and springs. 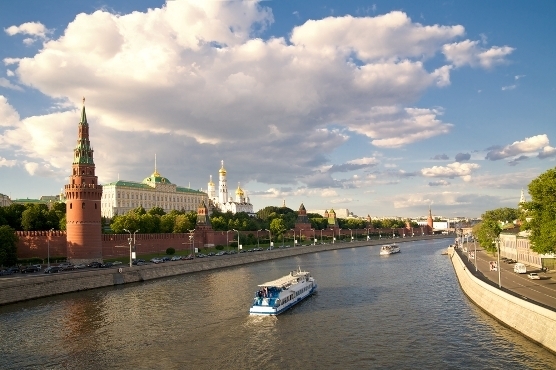 The carriages played a significant role in the life of Tsars and Emperors. They were the symbol of their power and richness. These carriages were not only used for transportation, but were the essential part of ceremonies – as coronations, gala rides and Royal marriages. Discover, how many carriages did Empress Elisabeth – daughter of Peter the Great – had in her personal collection? Other hall in the Armoury Chamber has a valuable collection of saddles and horse harnesses. 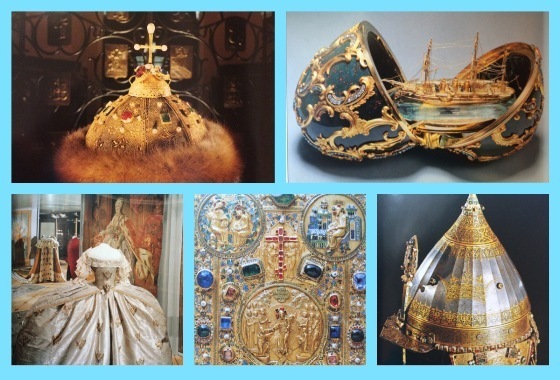 In the middle centuries a saddle was a traveling Tsar throne – that is why all saddles where made out of precious metals, covered with rich fabrics and decorated with precious stones. 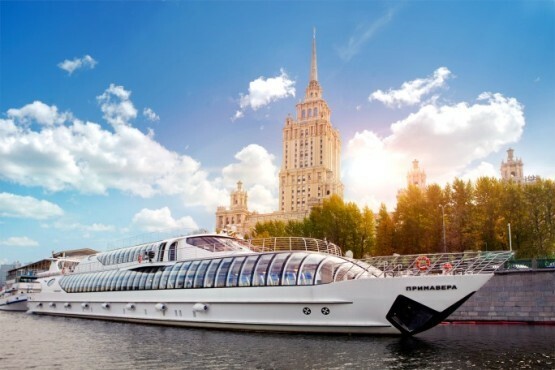 In the 17th and 18th centuries, there was a tradition to make gala rides for the Tsars. 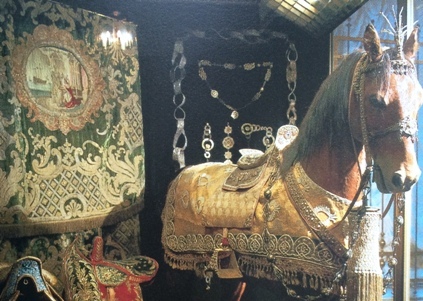 When going to his summer residence, pilgrimage or hunting – the Tsar was escorted by a train of horses, all dressed in a full set of ceremonial harness including a horse-cloth made out of velvet or brocade embroidered with precious stones and pearls, a head-stall decorated with enamel and gems, and a neck tassel threaded with pearls. The richly dressed horses were linked to one another by silver chains. When the whole procession was in motion, the glitter of the gold and gems and the jingle of the silver chains made an unforgettable impression. 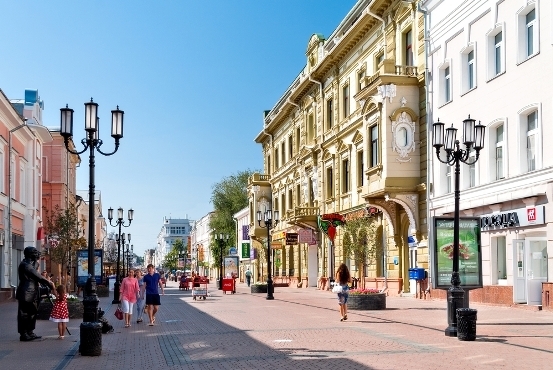 Fabergé Workshop was the largest jewellery firm in Russia in the 19th century with a world-wide reputation. It was founded in 1842 by Gustav Fabergé – father of Karl Fabergé under whose guidance the firm acquired its reputation. Karl Fabergé was a brilliant jeweler himself and he has a talent to find endowed craftsmen. 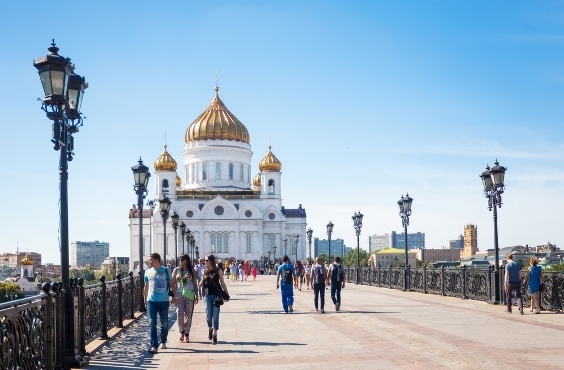 He had an international team of gifted jewelers headed by M. Perkhin – a brilliant self-educated jeweller of the Russian origin and a son of an ordinary farmer. 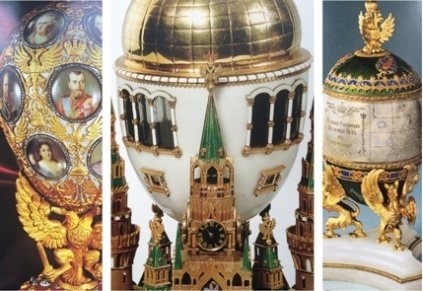 Easter Eggs for the Royal Family were made by Fabergé jewellers by the special order of Russian Emperors. They presented them to their wives and mothers as Easter presents. Every Egg was a masterpiece made out of precious materials and each had his own secret. Trans-Siberian Railway Fabergé Egg has a model of the real train which was put inside of the Egg. The train consists of platinum engine and five gold carriages and has a miniature mechanism inside that sets the train in motion. 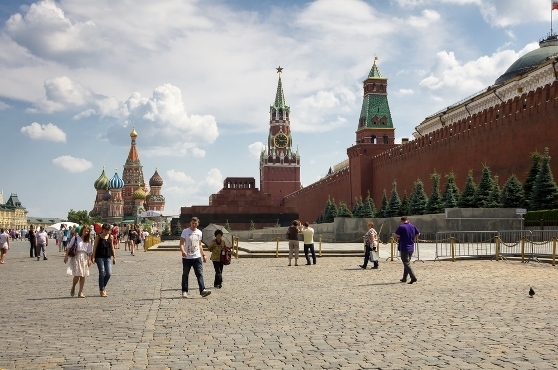 Discover, what is the secret of the Moscow Kremlin Egg? It will be checked before publishing the blog owner.